Justo worked as a window glazier in Bolivia. One day he cut his left foot on a piece of glass that had fallen to the floor. Justo knew that if he left work to visit a doctor he would risk losing his job to someone who could work the whole day. So Justo bandaged his foot and continued with his work. Over the course of the next year Justo´s wound did not heal despite his best efforts to clean it and re-dress the bandage regularly. When he finally visited a doctor they explained how badly infected his entire leg was and he urged Justo to go to the hospital for a leg amputation. After being released from the hospital Justo’s family tried to support him, but soon they began to run out of money as well. With no job and no money to pay for a prosthetic leg, Justo began to give up hope. 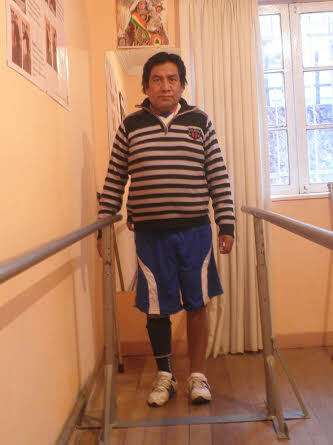 All of that changed when Justo’s wife heard about a clinic in La Paz that had donated legs and were providing free of charge. He was soon fitted with a LIMBS leg system. With his new ability to walk, Justo now has hope for the future and is looking forward to helping out around the house and returning to his job.